"You could probably defeat the combined armies of our empire and violate your oath regarding non-interference with other societies. I believe you all swear you'll die before you'll violate that directive. Am I right?" Uhura: I think I can pick up something visual. It's a news broadcast using a system I think they once called video. Spock: Television was the colloquial term. How a Captain of a starship becomes a slave who challenges an empire.... This episode suffers from a flawed, if interesting premise. The Enterprise is searching uncharted space for the S.S. Beagle, a survey ship that had disappeared six years earlier. After following debris from the ship, the crew taps into a news broadcast from the planet they find and it turns out to be very similar to Earth in the 20th Century—except on this planet the Roman Empire never fell. There is lengthy explanation of the Prime Directive in this episode and, like so many Star Trek plots that involve this unusual law of "non-interference," it leads to plot difficulties. Robert Merik (William Smithers), the captain of the Beagle has become the First Citizen of this parallel Rome and in doing so, has violated his oath not to interfere with the development of other societies. He conspires with the Roman Proconsul Claudius Marcus (Logan Ramsey) to lure the Enterprise crew down to the planet to prevent them bringing back word of this society and allowing "contamination." This 20th century Rome has slavery that has evolved into a social institution and gladiator games that are televised. When they first beam down to the planet, Kirk, Spock and McCoy fall in with a group of runaway slaves that appear to be sun worshippers and devoted to the idea of brotherhood. They meet Flavius Maximus (Rhodes Reason), a famous gladiator who has heard the word of brotherhood and renounced killing. He agrees to help them find Merik, but on the way into the city they are captured by the police as runaway slaves and taken to be sent into the arena. Random Notes: Character actor Ian Wolfe appears briefly as the leader of the escaped slaves, Septimus. He also appears in the Star Trek episode All Our Yesterdays as Mr. Atoz. Wolfe had a long and distinguished career in movies and television from the 1930s to the 1990s. There is a good action is this episode and if one can overlook the difficult-to-swallow premise of a planet that parallels Earth so conveniently, it is an entertaining show. But, after so many situations where people who have no business speaking English are speaking it, to have Spock remark on the amazing parallel of the slaves speaking 20th century colloquial English is a little disconcerting. Kirk: Mr. Spock, we'll leave orbit in two hours. Care to beam down and visit your parents? This is a top-notch episode with great action, suspense and intrigue. The Enterprise is assigned to transport over a hundred Federation officials to a planet called Babel for a conference involving the admission of the planet Coridan to the Federation. The issue is hotly debated and there are confrontations that seem to lead to the murder of one of the delegates. Meanwhile, a mysterious ship is trailing the Enterprise threateningly. Making his debut in this episode as Sarek—Spock's father—is Mark Lenard. He went on to make several more appearances in the Star Trek franchise as Sarek including Star Trek: The Next Generation's Unification episodes that also featured a guest appearance by Leonard Nimoy as Spock. Lenard also gave a well-regarded performance as the Romulan Commander in the original series episode Balance of Terror. Spock and Sarek had a disagreement about Spock's choice of career (Starfleet over the Vulcan Science Academy) and have not spoken as father and son for 18 years. Sarek is the prime suspect in the murder because of a disagreement with the murdered ambassador and the fact that the killing was done using a Vulcan technique. However, it turns out that he was incapacitated at the time of the murder because of a heart irregularity that requires immediate surgery. The operation requires a massive blood transfusions. Spock is the only donor available but he cannot give up command of the Enterprise because Captain Kirk himself has been attacked and stabbed by another delegate. The mysterious ship continues to menace the Enterprise and Spock is torn between duty to his father and his duty to the ship. An important figure is Spock's mother Amanda played very charmingly by Jane Wyatt, best known for her role as Margaret Anderson in Father Knows Best. In the unusual role of a human woman married to an man from another planet and the mother of a half-human, half-Vulcan son, she is totally believable and is very tender in her scenes with both father and son. Wyatt later reprised the role in the Star IV: The Voyage Home motion picture. Well-written and well-acted, this is one of the most enjoyable shows in the series, rating five Enterprises out of five. Image Transfer Review: The picture is finely transferred. I noted colors and details that I had never seen before. The way it holds up is a tribute to what made this one of the best technical efforts for television of the Sixties. Audio Transfer Review: The audio is remixed to DD 5.1. The sound is excellent and provides nice ambient enhancement. Dialogue is clear throughout. Extras Review: The same extras as the rest of the series. Booklet with some information and the two preview trailers. 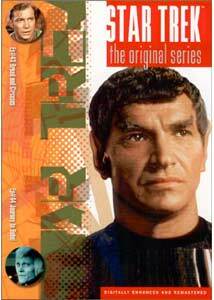 One very interesting episode and one outstanding episode makes for a highly recommended Star Trek TOS DVD. Kirk, Spock and McCoy have outstanding parts to play and their supporting cast is excellent. Live long and prosper.